Oooh, we love this gorgeous set of Swarovski sparkles!! Simple, elegant & guaranteed to make your glass stem glisten! Just £20 for a set of 6 assorted colours delivered directly to your door! Choose your strap colour & your silver dropper to create a Sunshine Bracelet unique to you! Each bracelet is £12.50 which includes a gift boxed & FREE UK delivery! Will you wear as single bracelet or stack them up, we wonder?? 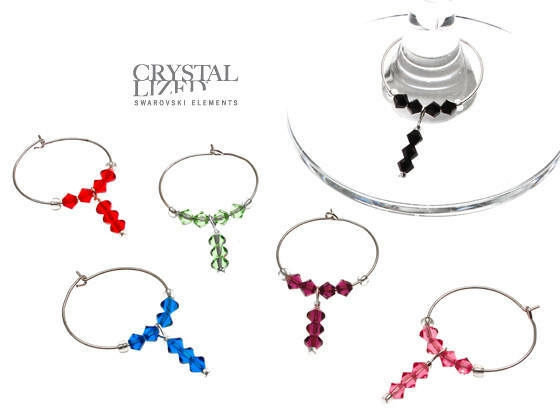 Beautiful full circle wine glass charms covered with Swarovski cystals & ready to sparkle your glass stems. Our Themed Wine Glass Charms are demi circles of Swarovski crystals featuring silver or crystal droppers. We have a gorgeous array of home accessories for you including tea towels, aprons & mugs. See all the Swarovksi Crystal colours that we keep in house for you to choose from. It's true! If you spend over £10, we'll deliver your order to you free of charge! Got a question? See if we can help you here & if not, do just get in touch!